The MS3-Pro combines the features of the MegaSquirt-3 with all available ‘expansions’ built right into a single circuit board in a sealed case. The o-ringed case is splashproof and, if you want continuous immersion resistance it’s easy to add a bead of silicone for extra protection. Furthermore, we’ve updated the power supply design to use a switching power supply to minimize energy consumption and maximize stability of operation. The MS3-Pro will remain powered up even if battery voltage drops as low as 6 volts! We also included the new intelligent knock sensor capability, allowing for advanced knock windowing and noise threshold configuration, integrated internal SDCard datalogging with time stamping of all datalogs, USB and RS232 Serial tuning interfaces, individual cylinder tuning for fuel AND ignition timing to allow you to compensate for differentiation in flow characteristics to different cylinders and truly maximize engine output, and more! The MS3-Pro is ready to support a wide variety of engines out of the box, with the ability to anything with one to eight cylinders with sequential fuel injection and sequential ‘coil on plug’ ignition, a V12 with sequential fuel and wasted spark ignition, or a four rotor Wankel with separate leading and trailing ignition outputs. Over 50 different ignition modes are supported, from mainstream applications like the GM LS1, Bosch Motronic, and Chrysler Gen III Hemis to unusual modes like Renix Jeeps and the Suzuki Swift GTI. 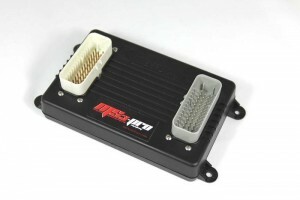 The MS3-Pro’s packaging is also a departure from some of the previous MegaSquirt EFI Systems. Instead of the industrial looking split aluminum case and D-sub connectors, the MS3-Pro uses a sealed high temperature nylon case for light weight and compact size, and heavy duty AMPSEAL connectors. This provides a compact and sealed enclosure protecting the sensitive internals from the elements. The MS3-Pro’s design keeps the heat generated to a minimum, allowing it to use a lighter plastic case instead of a metal heat sink. Learn more about the MS3-Pro and order one today!